Unemployment rates in Arkansas metro areas continue to show year-over-year reductions, with the decline in rates ranging from 0.3% in Fayetteville to -2.2% in Memphis. Statewide, the unemployment rate was down 0.5% from a year earlier (not seasonally adjusted). Seasonally adjusted estimates for September show that unemployment rate changes from August to September were mixed. Rates ticked up 0.1% in Little Rock and Pine Bluff, but declined in Fort Smith, Texarkana and Memphis. The drop in the unemployment rate for Memphis was particularly notable – down 0.4%. 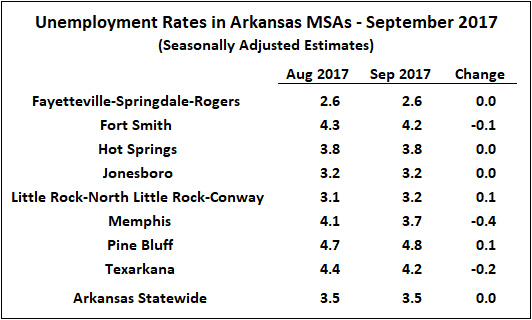 Nonfarm payroll employment showed increases across most of Arkansas’ metro areas, with the exception of Memphis (-0.2%). 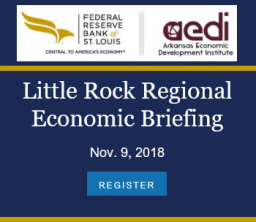 Jonesboro (+1.1%), Fort Smith (+0.8%) and Little Rock (+0.6%) were up significantly, with Hot Springs, Pine Bluff and Texarkana also showing increases (all +0.3%). 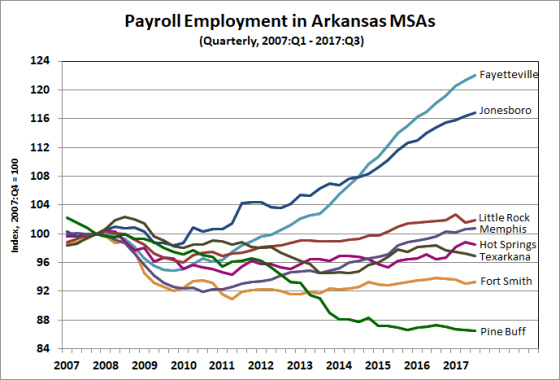 Employment growth over the past year has generally been consistent with longer term trends, with Fayetteville and Jonesboro leading the pack. Hot Springs has experienced above-trend growth over the past 12 months, +2.4%. 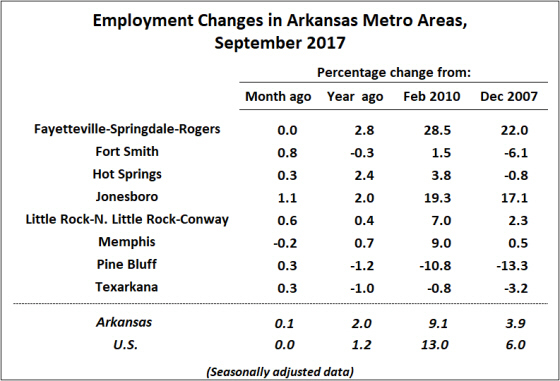 Fort Smith, Little Rock and Memphis have all shown relatively small changes in employment, while employment in Pine Bluff and Texarkana continues to decline.